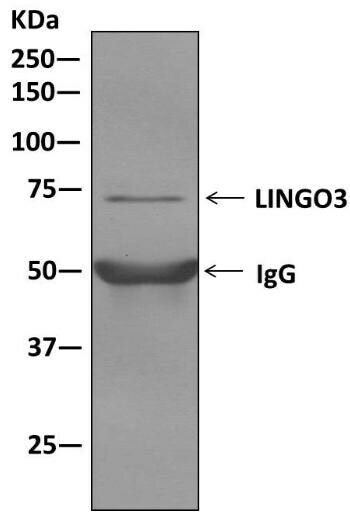 Synthetic peptide corresponding to residues in Human LINGO3 (UniProt P0C6S8). SH-SY5Y, U87-MG, 293T and NCI-H460 cell lysates; 293T cells; SH-SY5Y cells. Our Abpromise guarantee covers the use of ab169772 in the following tested applications. WB 1/1000 - 1/5000. Predicted molecular weight: 65 kDa. 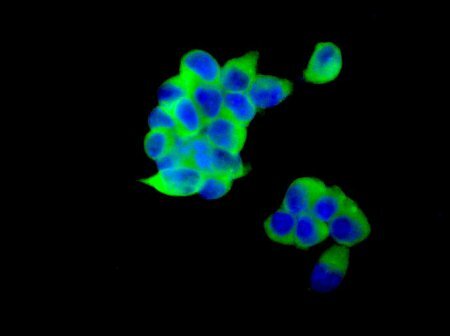 Immunofluorescent analysis of 293T cells labeling LINGO3 with ab169772 at 1/250 dilution (green). DAPI nuclear staining (blue). 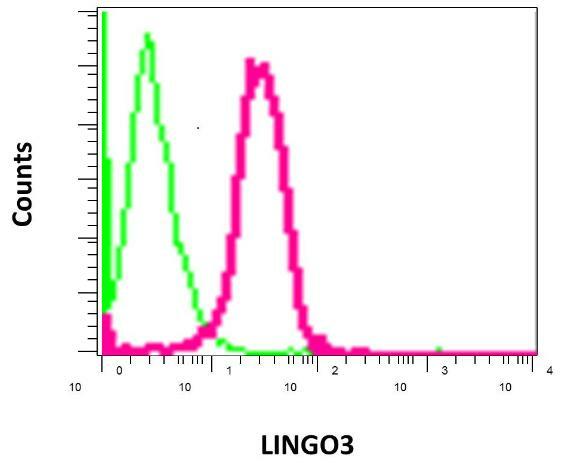 Flow cytometry analysis of permeabilized SH-SY5Y cells labeling LINGO3 with ab169772 at 1/100 dilution (red) compared to a rabbit IgG negative control (green). 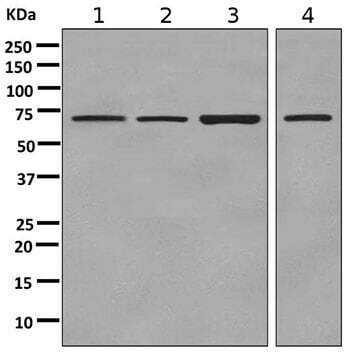 Western blot analysis on immunoprecipitation pellet from SH-SY5Y cell lysate using ab169772. ab169772 has not yet been referenced specifically in any publications. Publishing research using ab169772? Please let us know so that we can cite the reference in this datasheet. There are currently no Customer reviews or Questions for ab169772.